Clathrin is a protein with an extraordinary structure. It is a trimer with three leg-like subunits. Its extraordinary structure enables the protein to polymerize in a two-dimensional network consisting of numerous hexagons. Strictly speaking [the aggregate forms not a plane but] a bent surface with a convex and a concave side. It is an open question whether the tendency to bend has intramolecular or intermolecular causes. Especially important is the fact that such networks fit with their concave side tightly to membranes, for example to the inner surface of the plasmalemma. The growing network provides the mechanical force to pull the membrane into a bud. This bud is finally pinched off: a clathrin-coated vesicle has been formed. Coated vesicles are known to exist in a range of plant and animal cells (E. H. NEWCOMB, 1980). They bring extracellular substances into the cell, a process called endocytosis. Within the cell, the coated vesicles have the chance to fuse with other vesicles, for example with lysosomes. Their content is then digested by the lysosomal enzymes, the clathrin coat is dismantled and available for a new cycle. From SynapticSystems: Clathrin consists of heavy chains and light chains that co-assemble to triskelions. The light chains are differentially spliced, with neurons expressing a special variant that is not detectable elsewhere. The neuron-specific light chains are enriched in synaptic nerve terminals where they participate in synaptic vesicle endocytosis. Clathrin-coated vesicles are constantly assembling and disassembling to perform their task of transporting proteins from the outside of the cell inside. They are responsible for importing LDL cholesterol, and they play a role in breast cancer through internalization of a key receptor. During disease progression of HIV infection, clathrin-coated vesicles are subverted by a viral protein to cause down-regulation of the viral receptor CD4 in an important but not fully understood step. These molecules, and a wide range of others, are selectively trapped in the clathrin-coated vesicle for import into the cell. The new insights into how the vesicle forms help build a picture of the overall process and suggest possible targets for future therapeutic intervention. One mystery of clathrin vesicles is how the outer cage of clathrin assembles so rapidly. Vesicles are incessantly assembled and disassembled at an incredible scale. In the brain, where neurotransmitters are constantly released into synapses, the membrane used to export the neurotransmitters is constantly being dragged back in by clathrin-coated vesicles. "The equivalent of the entire brain, or a football field of membrane, is turned over every hour," says Tomas Kirchausen, associate professor of cell biology at the Center for Blood Research and Harvard Medical School and senior author on the article last year describing clathrin's atomic structure. The new work allows Kirchhausen and colleagues to propose that clathrin molecules add to the growing cage lattice by hooking into spaces in the existing structure, then rapidly rotating into a locked position. The process is reminiscent of images of alien space ships locking into the mother vessel. The new insights come from combining an overall view of a barrel-shaped clathrin lattice, obtained using cryo-electron microscopy by Barbara Pearse and colleagues at the MRC Laboratory for Molecular Biology in England, with the much more detailed view of a portion of the protein derived from X-ray crystallography by Tomas Kirchhausen, Stephen Harrison, and colleagues at Harvard Medical School, the Center for Blood Research, Children's Hospital and the Howard Hughes Medical Institute, and Andrea Musacchio, now at the European Institute of Oncology in Milan, Italy. 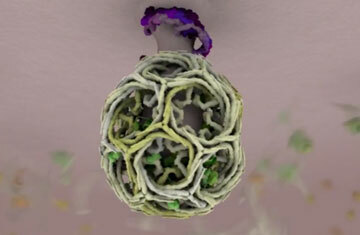 Click here to see a movie of how clathrin molecules form a geodesic sphere. Scientists have captured real-time footage of how a crucial cellular process begins, findings that overturn a long-held theory about how the chaotic machinery of life organizes itself. This research also provides new ways to think about how drugs might interact with life’s moving parts at the molecular level. The team found that, instead of following a specific sequence of well-ordered steps, the assembly of clathrin modules happened in a random, chaotic way. The initial steps in the formation of a clathrin-coated vesicle require two key materials: clathrin (which takes the form of three-legged molecules called triskelions) and its adaptor protein complex AP2, which allows the individual triskelions to stick together to form more complex structures. Clathrin and AP2 molecules, which are weakly attracted to one another, constantly diffuse throughout the cell, regularly bouncing off the membrane. When an individual AP2 molecule hits the membrane it stays there for a few milliseconds at most. “But if you happen to have the luck that at least two of those adaptors arrive to the membrane at the right time and place, they grab a clathrin and now it can stay there for a few seconds,” said Kirchhausen. As more arrive, the cumulative bond grows stronger, increasing the chances that the structure will complete itself. Clathrin triskelions are fairly rigid, curved forms that fit together into a precise, interlocking ball with a layer of membrane on the inside. As the triskelions accumulate, held together by AP2, they form a curved dimple (also known as a pit) on the cytosolic (or intracellular) surface of the membrane, eventually pinching off a complete balloon that floats freely within the cell. Kirchhausen said that it is commonly believed that strong interactions tend to drive biological functions inside the cell, and that most processes unfold in a highly ordered and directed way. “I am not so sure that that’s the case anymore. I think that most of the interactions that happen are fairly weak. So that gives the system flexibility,” Kirchhausen said. Brain cell membranes contain fixed "doorways" that control the entry of molecules into the cell, new research shows. The realisation represents a fundamental shift in the understanding of how neurons work. "We have found that the nerve cell is in a way like a room with only certain entry points, or doorways. Before, it had been thought that substances could move through the cell membrane at any point," says lead researcher Michael Ehlers at Duke University, North Carolina. To enter a brain cell, molecules such as receptors or pathogens must first be transported to the doorway sites. Understanding this process, and how to control it, could one day lead to an entirely new class of treatments for depression, epilepsy, addiction and other neurological disorders, Ehlers says. The researchers also found that the number and location of the entry points becomes further stabilised with age. This might partly explain why brain regions become less "plastic" - less able to change function - as they become older, he says. The brain establishes memory pathways, for example, by adjusting the strength of connections between neurons. This involves the precise control of the number of receptors for neurotransmitters (the brain's chemical messengers) on the receiving surface of a cell. Neuroscientists knew brain cells could reduce the strength of a connection by reducing the number of surface neurotransmitter receptors. They do this by allowing the receptors leave the membrane and enter the cell. They also knew that receptors, and other molecules, enter a cell via pits coated with a molecule called clathrin. But until now they thought these clathrin pits could form at any point on the membrane. All neuronal functions including synaptogenesis, synaptic transmission and synaptic plasticity require regulation of the surface expression of membrane proteins such as neurotransmitter receptors. One mechanism neurons use to accomplish this task is endocytosis, the process by which surface proteins are taken into the cell via a membrane-enclosed vesicle. For example, recent studies have shown that glutamate receptors, which mediate fast excitatory synaptic transmission, undergo an activity-dependent endocytosis, thus controlling synaptic strength. In addition, recent research in the Ehlers' lab has discovered a specialized membrane domain in dendritic spines termed the 'endocytic zone', where clathrin-mediated endocytosis occurs. In this light, my research is aimed at characterizing the functions of endocytic machinery proteins in dendrites and identifying their roles on endocytosis of glutamate receptors. A major question in synaptic receptor trafficking has been whether spines contain the machinery necessary for insertion and endocytosis of neurotransmitter receptors. Here, we show that clathrin coats form in most spines in cultured neurons. Clathrin coats in spines mediate endocytosis, in this case of Tf receptors. This demonstrates a remarkable self-sufficiency for spine membrane trafficking, and also indicates that the cargo-selectivity of endocytic coats in spines is low. Our first clue that the endocytic machinery in spines was distinct from the synapse itself came from the relatively low rates of colocalization of synaptic markers such as the scaffold protein shank, with clathrin-GFP puncta. The segregation of the endocytic zone from the postsynaptic density (as marked by PSD-95 expression) was striking. Despite an amazing diversity of PSD size and shape, the overwhelming majority of PSDs are closely associated with a clathrin coat. See our review article for more information regarding the importance of this organization in psychiatric disease. A) Certain molecules have been shown to be predominantly endocytosed via caveolae and not clathrin-coated vesicles. 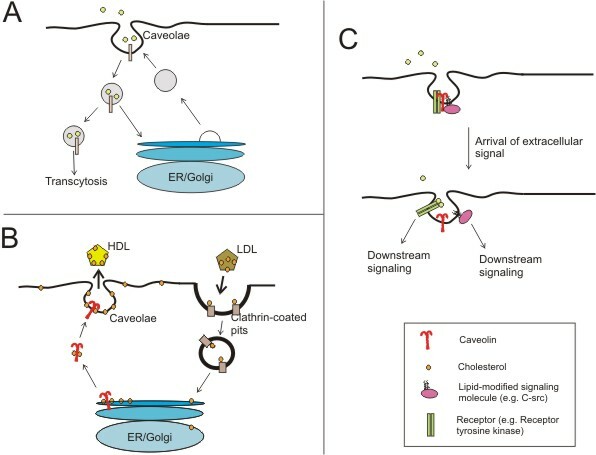 B) shows how both clathrin and caveolin are involved in carrying lipoprotein molecules through the cell membrane to and from the Golgi apparatus. (Check out John Kyrk's Golgi apparatus flash animation for a cool look at vesicles forming and carrying molecules within the cell. C) Caveolae are now thought to act as signalosomes, or entities in which signal transduction events can take place efficiently. A higher level of regulatory complexity is provided by the caveolins where signaling molecules can be bound until extracellular ligands relieve them of inhibition. Here, the dynamic regulation of a receptor tyrosine kinase (e.g. EGF receptor) and a lipid-modified kinase (e.g. the src-tyrosine kinase) in caveolae are shown. From Time Resolved Microfluorimetry: One of the most important membrane transport mechanisms is receptor mediated endocytosis (RME), responsible for triggering and regulating many fundamental cell processes, such as growth, nutrition, secretion, transfer of immunity to the foetus, motility, and cell adhesion. At the heart of RME is the receptor, a protein that picks up and transports specific molecules and particles (ligands) across the cell (see figure below). The surface of each cell is covered with transmembrane receptors. The ‘docking’ of the ligand to the receptor triggers a response in the cell which will be uniquely determined by the nature of the receptor/ligand complex and the type of cell. Following ligand binding, the receptor/ligand complexes enter the cell as coated vesicles (endosomes), which are formed when pits in the membrane pinch off. This internalisation can provide a signal for amplification or attenuation of a specific cellular response. Unfortunately, many harmful toxins and viruses can also be transported by this mechanism. Viruses for example have evolved to exploit RME by adapting their coat proteins so that they will bind strongly to certain receptors and be transported into the cell. There's a fascinating article in Nature called Spatial control of coated-pit dynamics in living cells that dives into how clathrin coated pits are tethered to the cell membrane and how the cell manages them in both time and space.